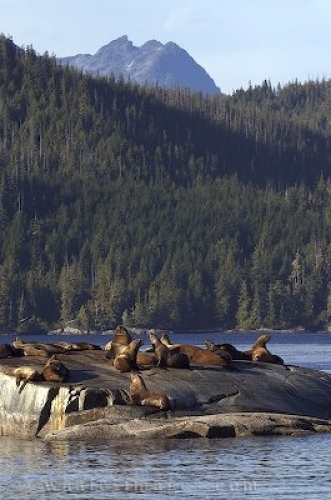 Pictures of Mammals - Steller Sea Lions - Eumetopias Jubatus, British Columbia. On a bright clear day in British Columbia, camera ready, I was out to get some great pictures of mammals. The sea was virtually flat calm, when we found this harem of steller sea lions. The forested island as a backdrop and the mountain peaking above made for a great photo opportunity. It was the perfect day for many different pictures of mammals including whales.